An old woman talked to the soldier. However, he killed her. Can you think of why? 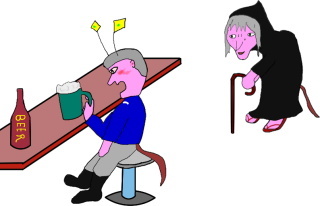 One day, an old woman approached the drunken soldier. "Oh, poor soul. I feel thy suffering." "To ease thy pain, that which you can't feign, takes but a flower for those whom you've slain." He shouted at the old woman. "What nonsense! I am not bad. They are the inferior race. It is God's will for our kind, the civilized race, to destroy the barbarians." In his anger the soldier shot the old woman.